Space Design offers a complete range of partition systems for all your functional and corporate needs. Our industry knowledge and expertise gives you the peace of mind that your installation will be carried out correctly and efficiently to the highest standards. In addition to our partition systems we can offer a complete interiors installation to include suspended ceilings, furniture, carpets, lighting, power and air-conditioning. It’s all part of the full project management service we offer. An office can be an ever changing environment with the need to adapt quickly and efficiently. 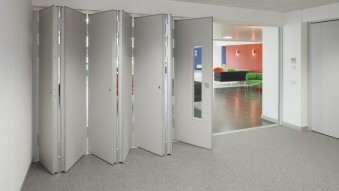 Space Design can supply and install a range of demountable partition systems to suit all office requirements. Set in an aluminium framework and Incorporating glazed modules, blinds and decorated solid panels, each installation can be designed to suit any application, and, if required, can be modified or re-located at a later date. 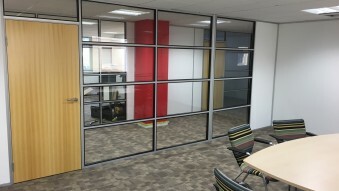 In most office environments there is a need for high quality performance partitioning to provide good levels of sound reduction for meeting rooms and offices. 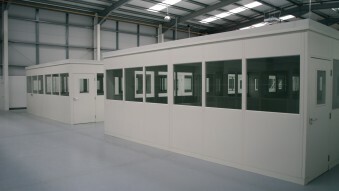 Also, many applications will require partitioning to offer a level of fire resistance. We can design and install a range of partition systems to meet the needs of the modern office, incorporating the requirements for current building regulations. 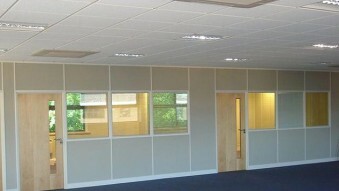 Our partition systems can include solid veneer doors, double glazed modules with blinds, and sound insulation. Contact our dedicated and expert team to discuss your requirements. Many companies now prefer a more open feel to their office space. 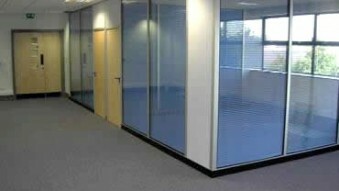 This is where our frameless glass partition system excels. The large glass panels create the idea of open space, whilst still providing the privacy required within the office environment. Our standard system is single glazed, but we can also offer a double glazed system. The glass panels can then have manifestation applied to a standard design or we can incorporate your own company logo. 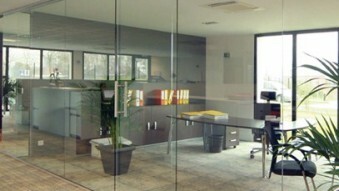 Brighten up your office space with our frameless glazing partitioning. For industrial areas our single skin and double skin partition systems are the ideal choice. Single skin steel partitioning offers an economical strong and robust partition and can incorporate doors, glazed modules and mesh panels for security cages. The effective division of space can often require flexibility. Whether the need is to divide an office area, conference suite, or simply create two rooms out of one large space, the answer is â€“ Movable Walls. Manufactured to the highest standard, and offering high level of acoustics, our Movable Walls are installed in offices, schools, sports halls and many other areas. We offer a full design service and free, no obligation survey and quotation.